You've been hard at work optimizing your site. You've already done things like lazy-loading Google Maps and been wondering if there was anything else you could do. For example, is there anything we can do to improve the loading of ads? Good news, there is some things you can do. You can respect the user's mobile data plan by loading ads only when they are likely to appear in the viewport zone. You can also serve ads in the right size in accordance with the screen of the device. That would be nice of you. That would not only be responsive but also responsible. The nature of Google Adsense is that the ads, along with the script, file are loaded automatically: this may unreasonably slow down the appearance of the other important things, like styles, fonts, or other scripts. Moreover, the correct ad size is determined only once right before the ad load. It means that if the user resizes the browser or rotates the tablet, the ad size remains the same and most likely doesn't fit the context anymore. There are many factors that Google Adsense considers for monetization, but "Click Through Rate" plays a major role in revenue. Therefore, focusing on clicks rather than just views in the long term may result in increased revenue. You can get more clicks by making your site look and feel trustworthy to a user. You can get that trust by prioritizing which parts of your website to load first. Serving ads first, instead of the actual content that the user came for, is a way to the decreasing ad clicks and impressions. It is typical for smartphone and tablet users to constantly switch between portrait and landscape modes until they find the most comfortable one. Providing the most appropriate ad size for each mode improves the possibility of getting more clicks. No matter where the ad is, above or below the viewport, it won't get loaded if the ad is out of view. The banner gets reloaded at particular breakpoints. adsenseloader.js; no dependencies (IE 9+). 1.1KB when minified and gzipped. 835 bytes when minified and gzipped. of a browser's window or viewport scroll. 250 means that this happens 4 times in a second. This part is responsible for controlling the size of ads. Using CSS, we will define the width and the height of the container element with the exact dimensions for the expected ad. With the help of media queries and a pseudo element, we'll set the guides for the plugin which will later be able to determine when to resize/reload an ad. Luckily, Adsense itself is able to pick the right banner size according to the given dimensions. The width and height properties for selector .adsense determine whatpseudo-element expecting. Remember that if you're using an ad blocker that blocks AdSense, you may not see this work correctly. 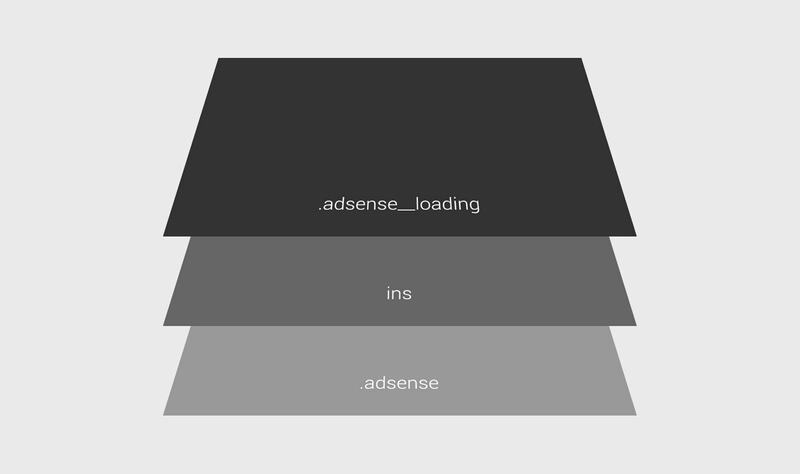 See the Pen Lazy-Loading Responsive Adsense Ads by Osvaldas (@osvaldas) on CodePen. You are welcome to follow and contribute to the project on GitHub. Thanks for reading and being a responsible web designer/developer. I thought loading ads dynamically was against the Adsense terms of service? Also, overriding the default css styles of Adsense is definitely in violation of their TOS. There are no default CSS styles of Google Adsense. ^ Can you guys cite your sources? I’ve read through the AdSense TOS and other guidelines and nothing seems to go against the (pretty sweet!) techniques in this article. See here: https://support.google.com/adsense/answer/1354736 – the techniques in this article seem to fall under the acceptable category of modifications. I remember there being issues with Ajax loading and having ads that could be seen as ‘auto refreshing’. Can’t seem to find it anymore though so maybe it was changed when they updated their support.google.com site. The plugin does no Ajax loading. The ‘Ajax’ was mentioned in the article by mistake, sorry, we’ll fix that soon. The plugin technically uses official ad initiation code by Google Adsense. But the difference is that it fires it one by one when it’s meaningful to do that, rather then then firing them all at once, no matter what. It’s against Google Adsense’s rules to automatically refresh ads when this is not related to user’s actions. This could be interpreted differently, but resizing browser’s window or rotating device is a completely conventional action taken by a user. Google Adsense already did a responsive improvement, and I believe it’s just a matter of time when they will come up with real-time responsiveness of the ads. It definitely seems they have changed (or at least better worded) their policies. Can this dynamically load more ads within infinite scrolling content? I think that was one of the big issues I found. Google would only ever serve 3 adverts to the page and would ignore any future requests even if you dynamically deleted off screen ads. I think I even tried moving the DOM node with JS which it didn’t allow. Yeah, waiting too for WP plugin :) And infinity load articles support. Great job, thanks! I always wondered why Google couldn’t do a better implementation of their “responsive” ads and this plugin seems that it could be a good solution until google comes up with something better. However I am a bit reluctant to use it because I am not 100% convinced that Google would be OK with it and I don’t want to risk getting banned from AdSense. It would be nice if the author could get somebody from google (e.g. Matt Cutts) to confirm that this technique is fine with them. The first thing I’m thinking about while adding widgets like Google Maps, Facebook Like Widget, etc. is how to make async lazy loading. Especially after moment when I figured that Google Page Speed diminish dramatically when adding some of Facebook widget (from 98% to 88% in my case). That was shock for me that adding such a common widget bring such performance trouble. Thanks for the article. You are doing a great job. Thanks for the get/eq remark. It would be interesting if this can be done with DFP ads as well. You can see the HTML codes here on the Pen of this plugin!